Hay Bro Sis....After a few months ago Kawasaki released a teaser featuring the latest generation Kawasaki ZX-10R, which is actually a revision of the superbike world champion WSBK bike is finally officially introduced to the public. Amendments not play or merely a minor change, but arguably the most Kawasaki ZX-10R undergo makeovers all-out in every part alias changed compared with lawasnya series. As information, Kawasaki ZX-10R last time a touch of new of engineers Kawasaki in 2011 yesterday, from the period of 2001 is now ahead of the end of the year 2015 Kawasaki re-do a thorough revision of the motor gahar this and is ready to shine in the exhibition ototmotif prestigious, Tokyo Motor Show (TMS) in 2015. Changes contained in Kawasaki ZX-10R was fairly total, starting from the specifications of the engine, the legs, the body design and fairing, improved aerodynamics, chassis, suspension, electronic features, and other braking. Total revolution made by Kawaski for Kawasaki ZX-10R is done for the sake of retaining the world title WSBK already achieved two times in a row. After the release of the latest Kawasaki ZX-10R, 1000 cc superbike motorcycle competition is increasingly crowded, especially Kawasaki ZX-10R will direct 'head to head' with Yamaha YZF R1 were first released. The news also circulated, stifling a spectator Suzuki now also under development berkubikasi powerful motorcycles 1000cc Suzuki GSX-R1000 is a planned launch in 2016. Among Japanese manufacturers, Honda living alone who is still keeping superbike racikannya. 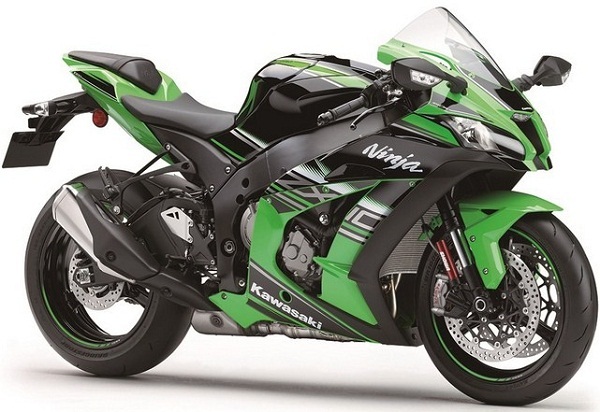 In addition to the Kawasaki Ninja ZX-10R 2015 currently has the power to 188 hp strong enough to compete in a variety of motor racing that saw the mass production becomes consecutive WSBK champion. With the update to the newer series, is the latest generation of Kawasaki ZX-10 will be born more perfect than the old generation? We should wait, if Kawasaki, compassion WSBK able to retain the title next year with the generation of the latest Kawasaki ZX-10R. Kawasaki ZX-10R where most claimed by the producers more resilient and virulent than lawasnya series.